Shane's love for writing started the moment she picked up a Nancy Drew book. At a young age, she began writing short stories, plunging into a variety of genres: from comedy and drama, to horror and contemporary romance. Shane's quite intrigued by the otherworldly or things otherwise deemed "impossible." Well, in her opinion, people never really grow up, do they? Once a high school star athlete, Branden admires Moya from across a classroom. She's feisty, outspoken, gorgeous, but closed off to anything not education-related. He can tell she's intelligent and passionate from her debating in class, still, isn't there more to college than books and studying? Branden is determined to get to know the real Moya, the beautiful woman underneath the cold veneer, the woman she hides from the world. Question is, will Moya let him in somehow? Even the best thought-out plans can change. In Shane Morgan's sweet and endearing New Adult contemporary romance, Impossibly Love, the one-directional way of thinking of the head can be swayed by the stirrings of the heart. As much as Moya wants to keep her distance from Branden, her eyes always seem to search him out. He's confidant, smart, caring, soft-spoken and so easy to look at. Her best friend, Vanessa, isn't much of a help, pushing her to date and go out. When Moya finally decides to give the persistently charming Branden a chance, unknown to her he carries a secret which may hinder her chance to fall in love. 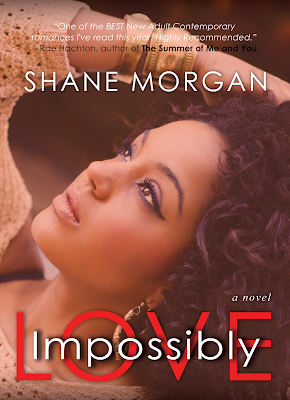 I beta read Impossibly Love and I'm proud of and thrilled for Shane Morgan's foray into the New Adult market. This author offers a realistic, culturally different and refreshingly needed couple's love story. Branden's secret hasn't been done in this market (that I know of) and there is a perfect blend of emotion, thought and action. In this one novel we see the before, during, and get a glimpse of the after of a couple destined to connect despite conflict. I really liked both characters and enjoyed their rocky journey to each other. Branden tries to deal with his secret the best way he can. He is selfless and incredibly strong, a true gentleman, and his feelings for Moya will not be denied. Moya feels her tough exterior chipping away and learns the problems of the past do not have to interfere with her future. She can be independent, achieve her dream, and still be able to share her life with someone. Both come from strong families and it was great to see the main characters depend upon their parents or siblings (I loved Branden's brother). Told from both perspectives in first person pov, Impossibly Love is a testament that not everything is impossible, especially if the heart is involved. Two equally strong characters go after what they want, shifting whatever plans they had in order to satisfy their hearts and be free to love. For Moya and Branden, anything is possible, even love, and as readers we are able to share in their affair of the heart. There is something so sweet about this cover. This is kind of how I imagined Moya to look at and her face portrays what she endures as she lets herself feel for someone else. I really like it. I received a promotional copy from the author in exchange for my honest review during a blog tour. Thanks, Shane, for sharing this story with me and the world.